A head-on collision in Orrington last week sent three people to the hospital, according to the Penobscot County Sheriff’s Department. Officers have not yet released the victim’s names, but report that the accident happened on Route 15, near Pleasant Hill Lane. The collision, which involved a motorcycle and a passenger car, is being investigated and witnesses are being interviewed to help determine a cause. Reconstruction experts are also working on the case to establish what happened in the minutes leading up to the crash. The Sheriff’s Department confirmed that three people were transported to local hospitals, two with “serious” injuries, and the third with non-life threatening injuries. Now that the temperatures are warming up, droves of motorcycle riders have been taking to the streets to enjoy recreational rides free of snow and ice. With more bikers on the road during the summer months, Maine motorists need to place extra attention on staying alert to surrounding traffic and sharing the road safely with motorcyclists, who have little in the way of protection in the event of an accident. “This time of year, motorcycles are coming out. It’s nice weather. Operators of motor vehicles need to be cautious and aware that motorcycles are coming out and at an intersection, take that time to do a double look. Look twice. Look for the motorcycle riders,” cautioned Patrol Sgt. William Birch. Nearly half of all fatal motorcycle accidents are the result of a bike colliding with a passenger vehicle, according to research from the National Highway Traffic Safety Administration. An estimated 80 percent of motorcyclists suffer serious injury or death in auto-motorcycle crashes, compared to just 20 percent of car drivers and/or their passengers. Even the most experienced and cautious motorcylists are at risk for catastrophic injury when they hit the road. Distracted drivers who aren’t paying attention to their surroundings may fail to register the low-profile of a biker at an intersection, and each year thousands of motorcycle riders are killed because of reckless drivers who turn in front of them. 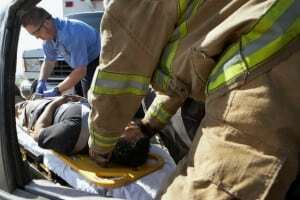 If you were harmed in a crash by a negligent driver, the Maine motorcycle accident lawyers at Hardy, Wolf & Downing have the resources and expertise to help. We will work hard to recover the compensation you rightfully deserve, whether through an insurance settlement or filing a personal injury lawsuit. Potential liable parties include negligent drivers, the municipality in the event of poor road repairs, or manufacturers of defective parts. Our Maine personal injury attorneys represent clients in Portland, Bangor, Lewiston and all of Southern and Central Maine areas. Call us at 1-800-INJURED for a free, no-obligation case review.